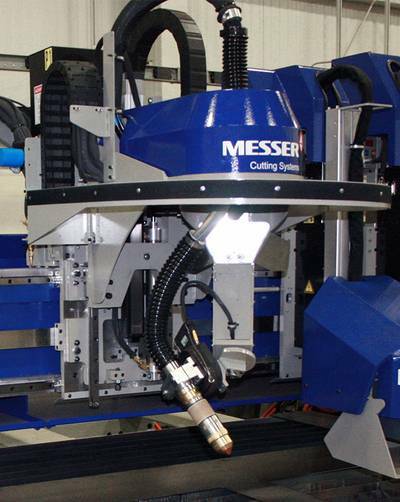 Messer Cutting Systems announced its new product launch, the Delta plasma rotator. The launch of the Delta is scheduled for the 2013, Fabtech Show in Chicago, Il., North America's largest, metal forming, fabricating, welding and finishing event. With over 35,000 attendees and 1,500 exhibitors this provides an excellent platform for the market launch of the Delta rotator. The Delta features new robust compact design, drives, along with a new Messer designed torch holder assembly, coupled with our OmniBevel software, creates the best cut parts available on the market. The Delta will be featured on our multi-functional Titan III cutting machine. Messer is also promoting two other new products; a Telesis Pinstamp for plate marking, and QR reader program to assist in maintenance. Their focus at the Fabtech show will be to give new and existing customers a hands-on approach with live demonstrations of steel plate marking and cutting. Also demonstrated will be the plate alignment/hole detection video camera on Messer's other cutting machine the EdgeMax.